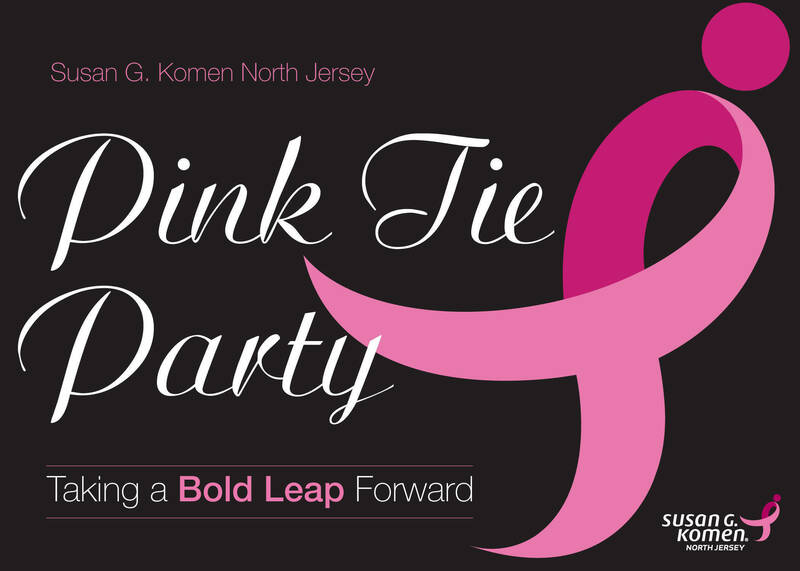 Komen North Jersey will be “taking a bold leap forward” at its annual Pink Tie Party, as it sets its sights on its BOLD GOAL to reduce the number of breast cancer deaths in the U.S. by 50% by the year 2026. 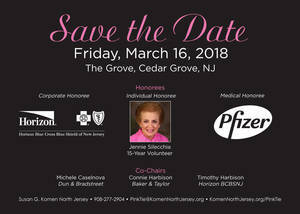 Funds raised at this signature event will help towards achieving this goal, which will be accomplished by improving access of the underserved to quality and timely cancer care and enhancing Komen’s national research focus on the most lethal breast cancers. This year’s event, co-chaired by Michele Caselnova (Sparta) and Tim and Connie Harbison (Hillsborough) will pay tribute to 15-year volunteer Jennie Silecchia of Chatham and honor Horizon Blue Cross Blue Shield of New Jersey and Pfizer for their exceptional commitment to the organization’s mission. Beloved radio personality Patty Steele, co-host of WCBS-FM’s popular morning radio show “Scott Shannon in the Morning,” will serve as this year’s Master of Ceremonies. The evening will include cocktails, dinner, dancing, silent/live auctions, and entertainment by Tribeca Rhythm and DJ Sizzling Sounds. 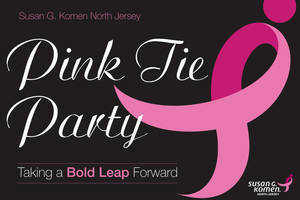 To purchase tickets, or for more information, visit www.komennorthjersey.org/pinktie, call 908-277-2904, or email pinktie@komennorthjersey.org.